As our Wet Season approaches we have experienced some very hot and dry days rather than the usual cooler and more humid days. Of course when I say “cooler” I mean below 35c/95f and “hot” is over 43c/110f. Night time temperatures are only down to 27c/80f, so there are no blankets in sight! 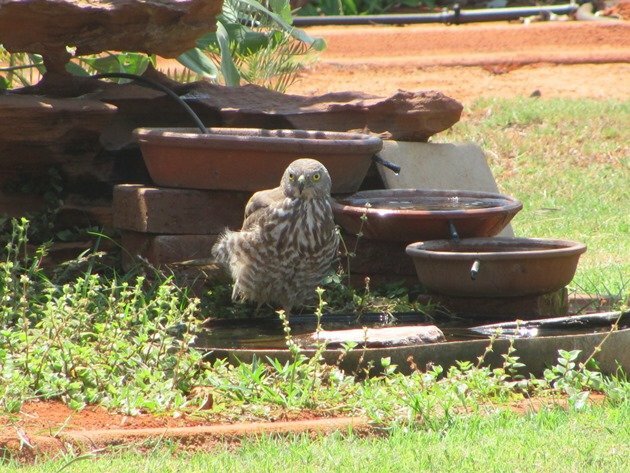 Early every morning we have birds in our garden getting a bath and drink, but the hottest days bring in the birds of prey and one of our most regular visitors is the Brown Goshawk. It swoops in and will stand for up to an hour with its feet in the water that we provide in an attempt to keep cool. 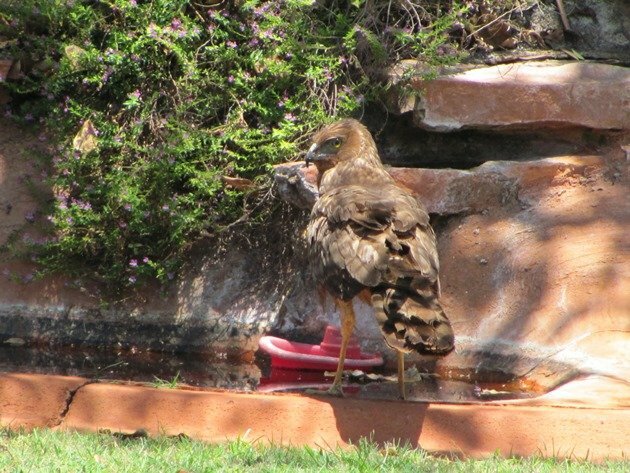 When it is extremely hot the other birds will also enter the garden using an alternative water source despite its presence. It is important to have several watering points to allow for a variety of birds to enter and drink. 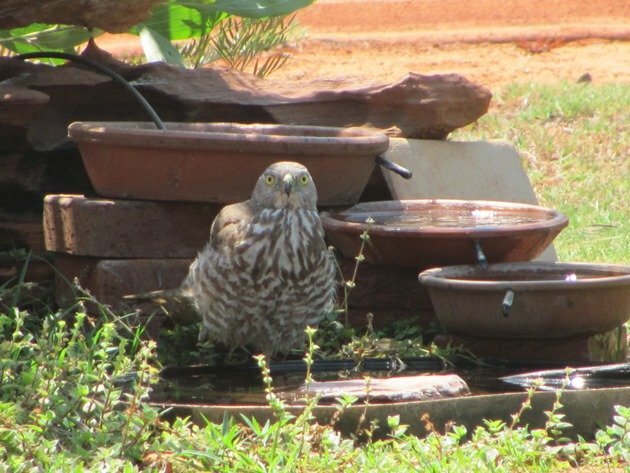 This juvenile Brown Goshawk spent an hour standing in the water source that is very popular with the Double-barred Finches and Zebra Finches that visit our garden. Our other watering point has a deeper pond as well as the shallower pools above that flow down and is enjoyed by many of the birds that visit including the Pheasant Coucal. 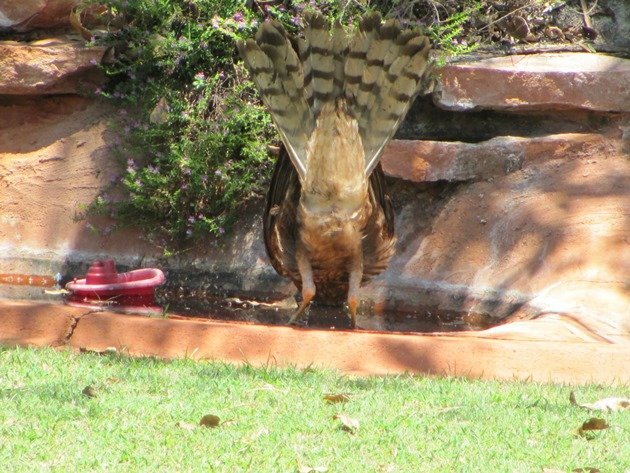 This week we came home on one of the “hot” days to discover we had our first Spotted Harrier in the garden getting a drink. Of course it may not have been the “first”, but the “first that we had seen”! It was not concerned by our presence and spent several minutes drinking and then returned to the skies. The plastic boat was not of any concern either! It was in the exact same position as the Striated Heron over two years ago and our garden is often a source of surprise. You wonder how some species even know the water is present, but we would never complain….especially when such great birds as Buff-banded Rails drop by! 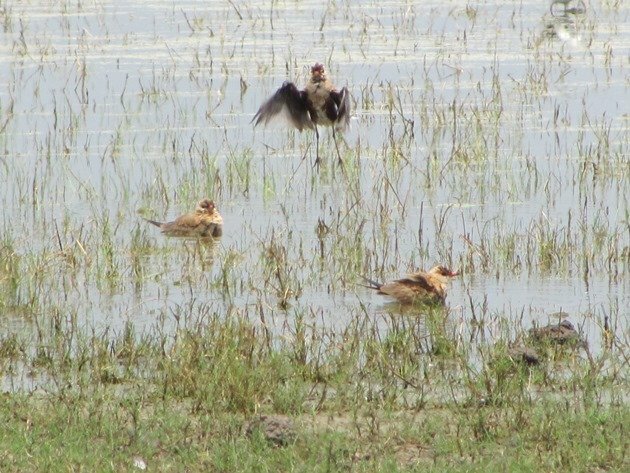 On very hot and dry days it is also worth making a trip to one of the local ephemeral lakes to experience the “hot birds”. 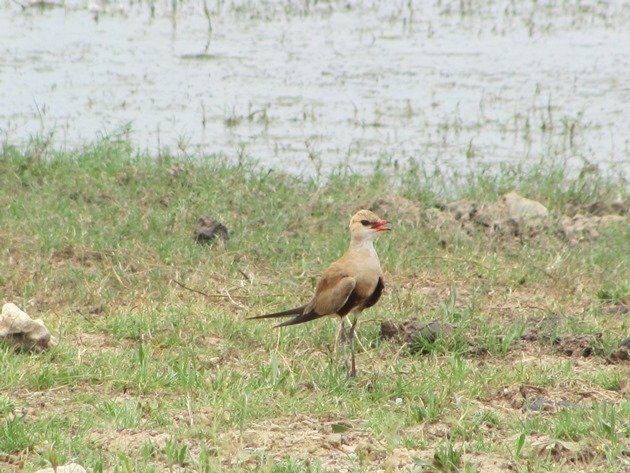 Our recent trip showed us the effect that the heat was having on Australian Pratincoles . 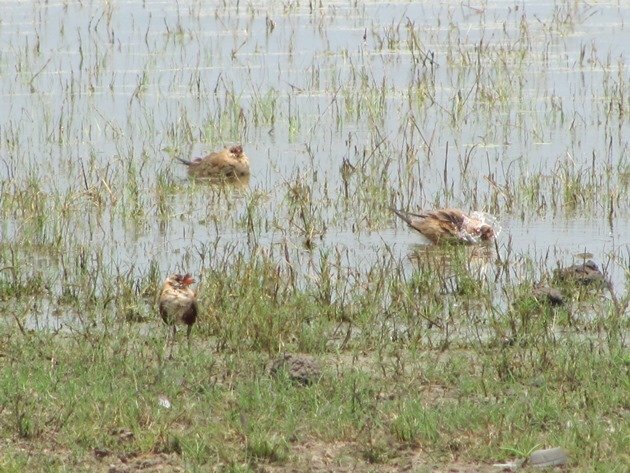 There were numerous birds stood around the edge of the lake and they were still in their breeding plumage and had their bills open in the heat. The birds would then wander into the lake and have a good bath to cool down. 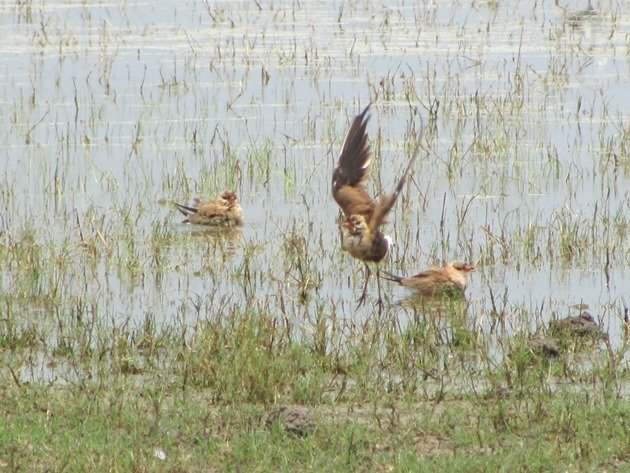 They would then leap spectacularly out to dry off! 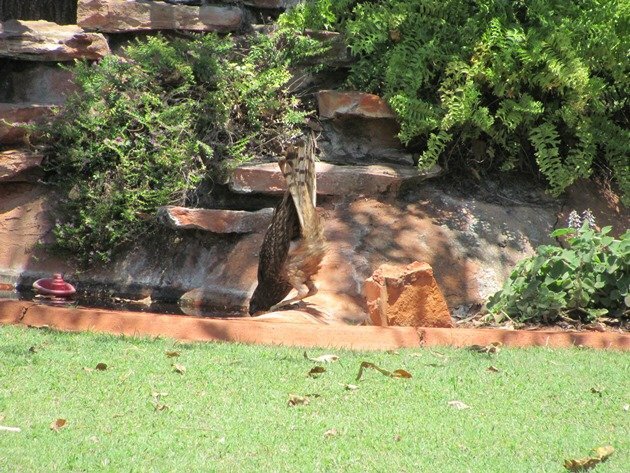 Until we get our first Wet Season rains the birds will continue to rely on water sources like those in our garden. Let’s hope we get a few more surprises in the coming weeks! What a brilliant system you’ve developed in your garden to help the poor birds survive. Thank you for taking care of them in that tremendous heat! Thanks, Wendy….water really is so important to birds. Another Thumbs Up for Avian Radar?